Most of us, myself included, have cheaply made furniture sitting in our homes that we paid too much for, or thought it was awesome because the store had a Swedish name. --- Part of being in a consumerist world is the obsession for things that serve a purpose, even if they don't last very long, which they inevitably don't. Proof of this: As I write this, I'm sitting in a chair from my kitchen that's about to fall apart, a chair I bought because the office chair I had before that fell apart. Gavin: Hey, Chad. First thing, tell us a little bit about yourself. Chad: Basically, I’m a family man building furniture in Salt Lake. I wake up every day wanting to be creative, and love to be challenged with difficult projects. I don’t always get that yet and need to take work that will keep the lights on and food on the table, but I’m working hard to one day fully live the dream. I enjoy many things in life -- fly fishing, climbing, making tasty meals, a cold Pepsi and good friends. But, I am completely passionate about my family. I have a beautiful wife who puts up with me and is so supportive, and the greatest 1-year-old boy, Stelios. Gavin: When did you first take an interest in woodworking, and what was it like learning it growing up? Chad: I’ve always had an interest in wood working, maybe because throughout my childhood there was sawdust on the garage floor from the old man working on side jobs. Gavin: What were some of the first things you created on your own without help, and how was it for you becoming self-reliant in a functional art form? 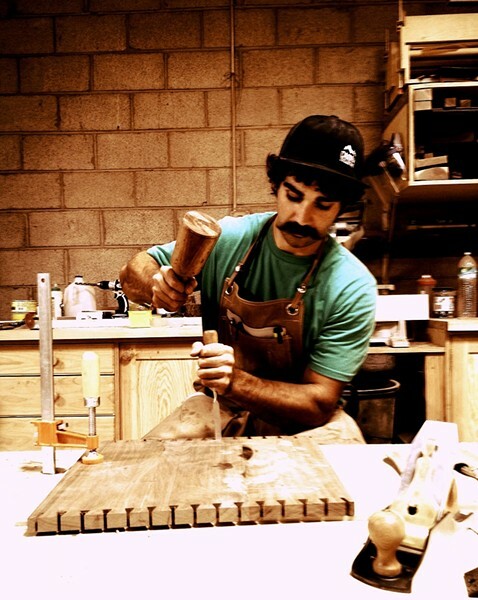 Chad: One of the first things I built was a dope skate ramp when I was 12 for all my friends on the block -- the ramps never broke, but a few arms may have; a jewelry box or two for some ladies; some bowls in shop class. But, the first serious thing I built was a bed when I got married. 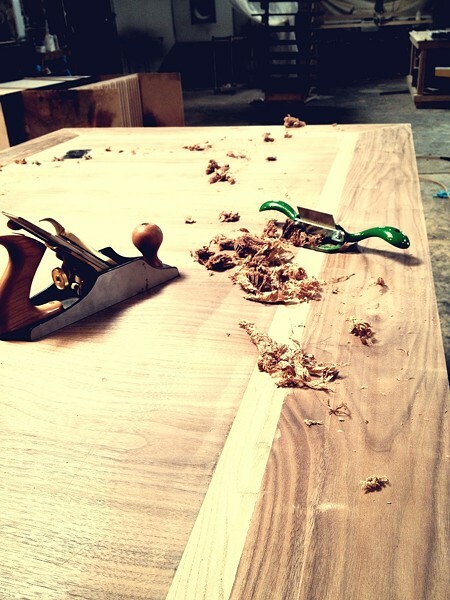 It was really easy transitioning to a furniture maker -- I have always been confident in my ability and was taught that I could do what I wanted. 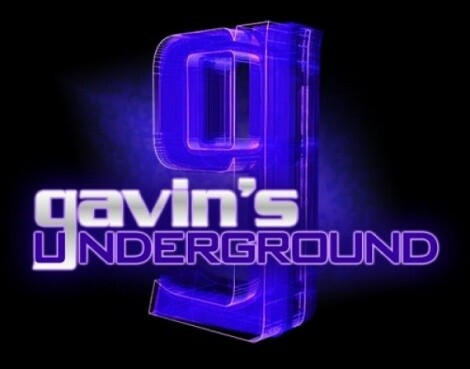 Gavin: Did you take any educational courses along the way. or was everything you learned self-taught? 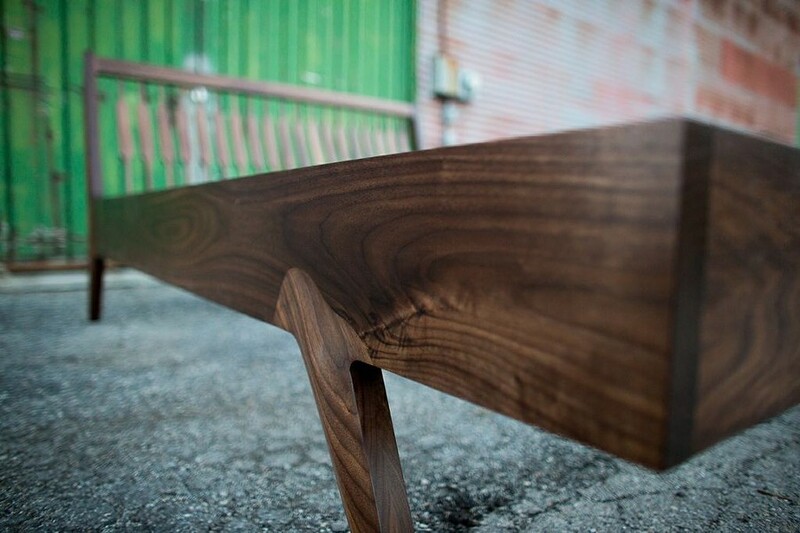 Chad: I worked at a place sanding furniture parts like a robot and decided I never again wanted to work like that; I wanted to really create, to be the individual involved from the design process to the finished product. I would say I’m pretty much self-taught through lots of reading, and, of course, trial and error. Gavin: What specifically drew you toward making furniture? Chad: It’s hard to say what exactly drew me in. I remember always respecting things made by hand. 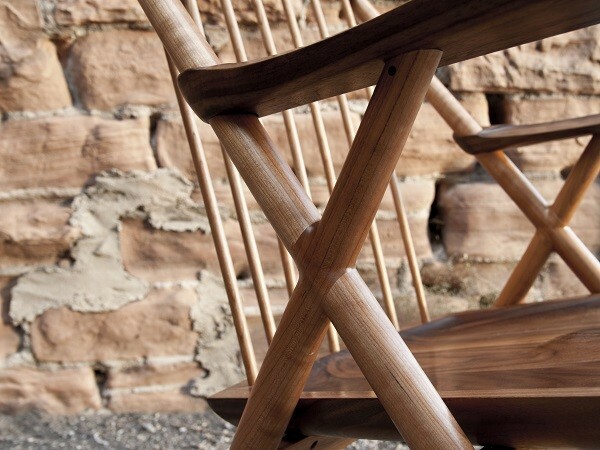 Whether stone work, furniture, or art, I wanted to make things for people to enjoy and enrich their lives. It’s funny that it’s taken me so long to do it because I always knew I was going to some day. Gavin: How did the idea come about to start up your own business? Chad: I had a construction business in Idaho before I got married. When we got engaged, I moved down here, and knowing I would have better opportunity for woodworking, the Furniture Joint was born. I took whatever small jobs I was offered and have been able to build a network of people also in the biz and am managing to stay fairly busy. It’s a blessing to be able to work for myself, and now I don’t think I could ever have a boss again. Gavin: When did you come across the location along 400 West, and what made you decide to take it? Chad: I was sharing my friend’s garage shop with him for a long time and it was getting too small for the both of us. In an effort to get me out of his hair, we looked on KSL for another space and found the 400 West shop. It’s perfect -- good location, good shopmates; I love it and hope to be there for a while. Gavin: What was it like for you getting set up and formally opening the shop? Chad: Well, fortunately, the place on 4th was already set up as a shop so I just moved in, renting with a talented cabinet maker. I built a bench and got to work. We realized that the roof leaked after a serious rainstorm left water on all my stuff, and I moved to the other side of the shop, where I am to this day. 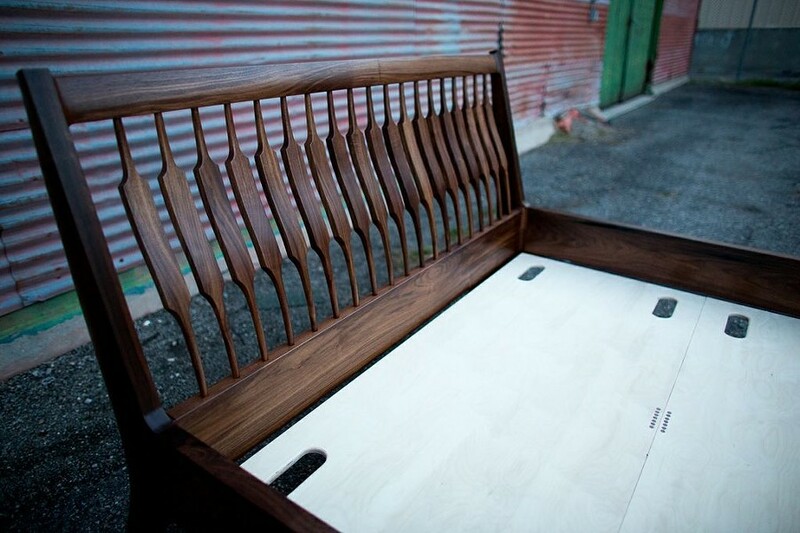 Gavin: What's the process like for you in creating a piece of furniture, from design to construction to final product? Chad: Well, I have a hard time at the start. I almost always have a vivid design in my brain but I am terrible at drawing. In the past, I tried so hard to sketch my designs, but it would look so bad that it ruined the picture in my mind. So now, I just build -- no drawings, just the idea and some rough measurements. It works well for me and I problem solve as I go. If a client wants to see a drawing, then I will hire my friend to draw for me or I will make a model of the piece. I find that the actual construction is the easy part. Then, it’s awesome to see the life of the wood transform while putting that first coat of finish on. It really fulfills the dream I had as a kid to make beautiful things for people to enjoy. It’s super-satisfying to see the piece go to a client who appreciates it and then move on to the next project. Gavin: Is there any kind of fine-selection process to finding the wood you use, or do you simply order what you'd like to have and work with what comes? Chad: I do my best to find local hardwoods, and got my hands on a few trees that I have slabbed up, but for the most part I go to the lumberyard and pick through their piles until I find the board that speaks to me -- then I keep digging till I find more. I’m actually really picky during the process because I want to showcase the natural properties of the wood. I know I’m not going to hide anything with the type of finishes I use so finding the best pieces is so important to me. Gavin: How do you go about deciding what kind of material to use and determining what will look best? Chad: I have never been a fan of staining wood. I will if the customer really wants to, but it’s not my favorite. I feel like natural wood is so appealing already that it doesn’t need to be enhanced a whole lot and shouldn’t be altered much. If people tell me they want something dark, I suggest using walnut, which is a darker wood that is gorgeous so I love working with it. 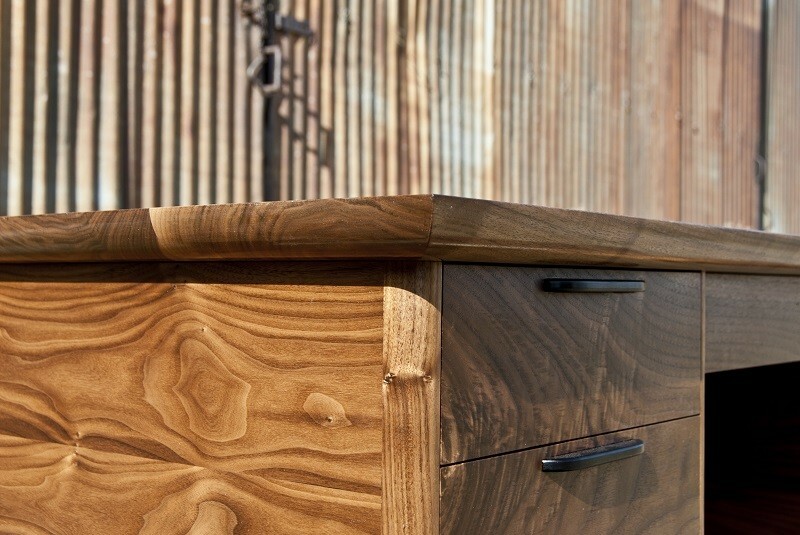 I like combining different species to show the contrast in the wood varieties in the same piece of furniture. A lot of times, I will show clients samples of natural woods and we just find out what they like. Gavin: When it comes woodworking, there are people who use all power tools, people who are totally traditional craftsmen, and many like yourself who fall in-between, using both. How do you determine the best way to put materials together? Chad: Obviously, I love hand tools, and if there is anyone out there wanting to pay me to use only hand tools, I will agree gladly. Ideally, I would head to a forest with my axe and not use a single power tool or machine for the entire process; that would be my dream. But realistically, people want their furniture on a deadline, so I find a happy medium in mixing the two techniques. I still tend to opt for the hand tools when I can, though, and feel a lot of pride when I can put my unique touch into a piece by hand shaping an aspect of it. I love that no two pieces end up exactly the same that way. Gavin: Aside from considering the use and aesthetic, how much work do you put into creating a style to your designs? Chad: I really appreciate most styles of furniture; a lot of them I would not choose to put in my own home but I still respect them and enjoy making them. But, I’m so drawn to mid-20th-century modern-style furniture and have some heroes in that era whose approach to building I feel I have adopted. I really admire the late Sam Maloof; he seemed to be as genuine with people as he was with his furniture. Most nights, I can’t sleep because my son is pushing me off the bed so I sit there thinking of new designs and taking classic designs and putting my own twist on them. It really isn’t as much work coming up with a design as it is just having uninterrupted time to think and imagine. Gavin: Do you get a lot of requests and custom orders for specific items or wood to be used, or do you mainly stick to what you prefer to create? 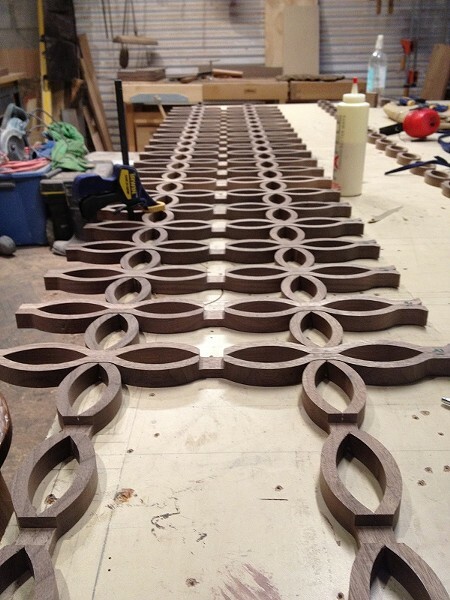 Chad: I mainly do custom orders and I’m willing to use all types of materials. But at the same time, I try to sell my own designs, of course. A lot of times, people aren’t totally sure what it is they want, and I think because I love it so much I am able to convince my clients that the style I enjoy will fit their needs as well. Whatever we come up with, so far they have always been happy in the end. 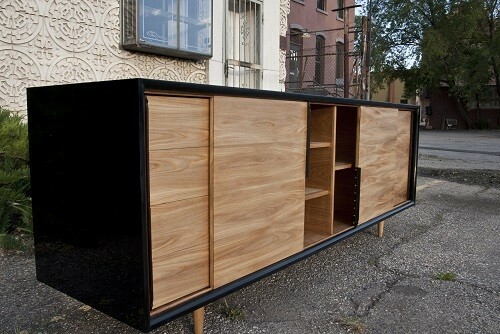 Gavin: From what I've seen, you create a lot of practical furniture. Would you want to create bigger or more extravagant pieces down the road, or are those projects too big for the setup you have now? Chad: Furniture is my passion, but if something needs building, I’m your man. So, I started manufacturing wooden parts for Alpha Dominche, a neighbor to our shop producing these amazing coffee machines. I also recently finished building a 32-foot walnut-burl bar top at Bodega on Main Street that took “the rest” of my sanding pads down to nothing. I am really excited to build anything that is cool and exciting, no matter the size. I hope to push a wooden drift boat out of the shop in the next year. My brother, whose boat I keep borrowing, says I will never get around to it, but I’ll show him. Gavin: Are there any plans to expand down the road, or are you happy with how business is now? Chad: I’m really quite happy where I am at; no new plans yet. I want to stay involved with all levels of my business, so although I want to keep busy, I never want to expand too much. 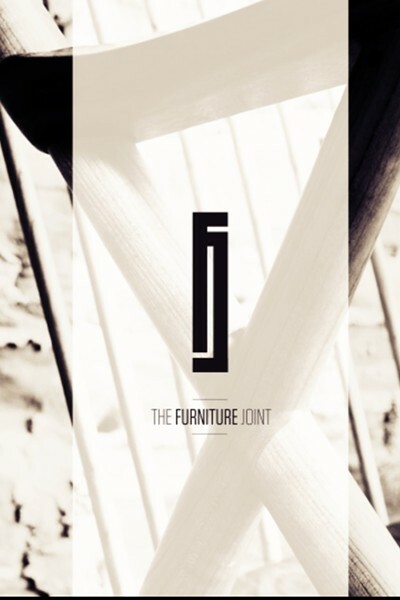 Gavin: What can we expect from both yourself and The Furniture Joint over the rest of the year? Chad: Well, I’m trying to talk my wife into making another baby, and then as many of these designs as I can get out of my head and onto the workbench. I would sure like a storefront or showroom downtown; we’ll see. Chad: I would like to shout out to my friends and fellow woodworkers in the valley, the people I’m in contact with everyday and who are a big help to the cause: JThompson Workshop; IvoryBill Workshop; my boys at the insulation dept., Holland, Max, and Dave, of Chamberlain Cabinetry. Thanks to anyone else who has brought me a cold Red Bull at two in the morning, trying to get a project out the door! 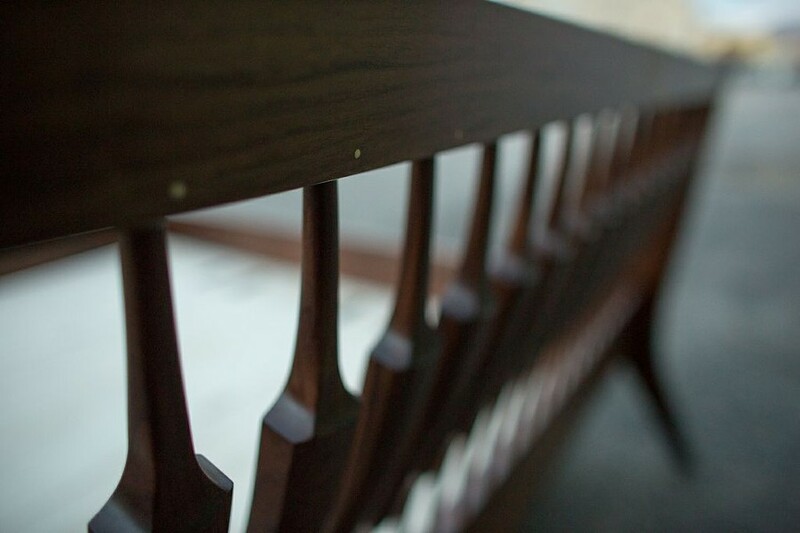 Please, if you need anything built by hand by a local man, send me an e-mail at thefurniturejoint@gmail.com.